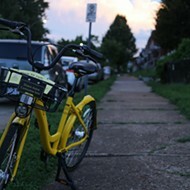 St. Louis' new bike-sharing program kicked off today. 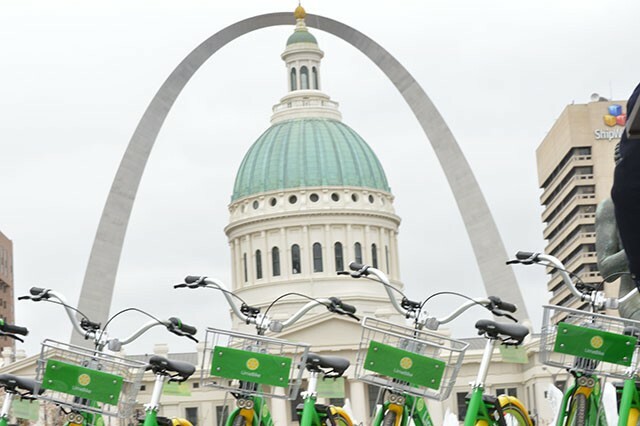 With the addition of a new "dockless" bike-share program, St. Louis joins the ranks of cities including Washington, D.C., San Francisco, and Portland when it comes to offering easy rides around town to see the sights. But even while boosting the tourism industry, the program also promises to nod to the needs of those who call St. Louis home. At a press conference today in Kiener Plaza, the city officially kicked off its first-ever bike share program, with bicycles ready for immediate use for anyone brave enough to pedal through the cloud cover and flurries. However, as the weather warms, city dwellers should expect to see crowded sidewalks and bike lanes, as no less than 5,000 bikes will be hitting the streets in the coming weeks. Providing the bikes are two competing companies, LimeBike and Ofo, both pioneers in this new age of bike rentals. 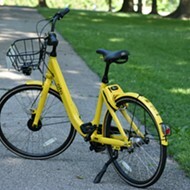 Traditionally, bike share programs required a docking station and kiosks and only allowed for a limited number of bikes. 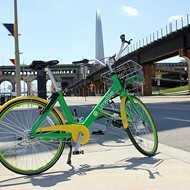 Utilizing smartphone technology, LimeBike and Ofo have instead created "dockless" bike share systems — as long as you've downloaded the app and are willing to be charged $1, users can "pick up a bike from any location and ride it to any location for a nominal cost," Mayor Lyda Krewson promises. Each bike is equipped with a GPS and a locking mechanism on the back wheel. 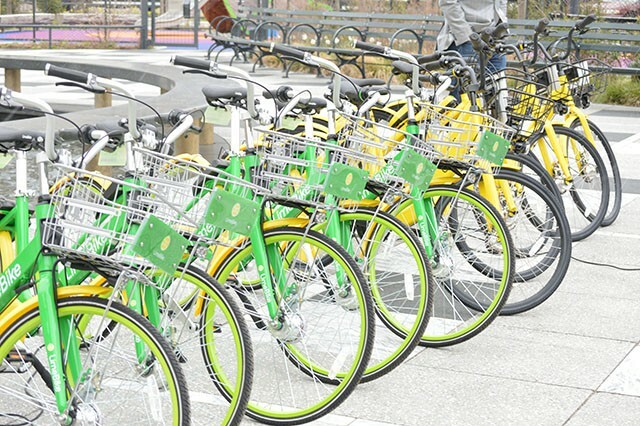 By downloading LimeBike's and Ofo's respective apps, cyclists can find the location of bikes and unlock them with just their smartphones. First proposed in January by Alderman Scott Ogilvie, the program has been gaining support over the last year. Bi-State Development project manager Liza Farr helped sell the program to private companies, who will own and operate the program and, backed by venture capital funds, cover its costs. Because of that, the program will cost the city nothing. 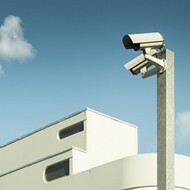 However, the operators will still be looking for profit, so it's not completely free for users. Ofo is offering the first ride for free. After that riders will pay $1 per hour. 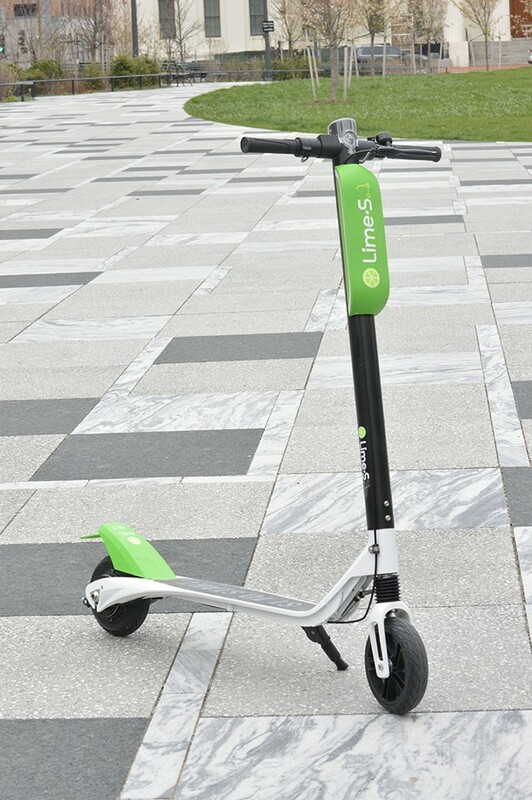 LimeBike's price is set at $1 per half-hour, but the company also offers a 50-cent student discount with a valid ".edu" email address. A large concentration of the bike share program is designed to provide transportation to low income areas. A government ordinance states that both companies must make at least twenty percent of their bike fleet available to under-served communities. For residents of target neighborhoods, LimeBike is offering 100 rides for $5. 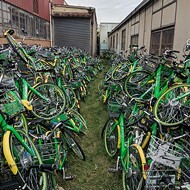 "In particular, the access to public transit in low income areas is often a barrier to people finding and keeping jobs," says LimeBike Director Sam Sadle. "We want to be a part in solving that by providing inexpensive access to get where they need to go." Those looking to utilize the bikes who do not have a smartphone can rent a bike by signing up on either company's website. 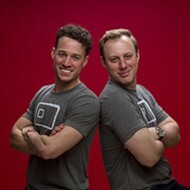 "There's a lot of investment in communities all over the world," says Ofo Director Carter Stern. "But there's not always a focus on making sure those advancements bring everyone along with them." For both companies, the work the city had already put into the program's foundations became an opportunity. 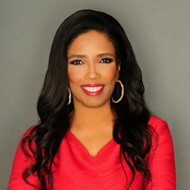 But it's not just the city of St. Louis that organizers see participating in the long run. Says John Nations, president and CEO of Bi-State, "I can certainly see it expanding into other municipalities, into St. Clair County, in Madison County, in Monroe County in Illinois." In the mean time, the program is expected to enhance St. Louis for residents and tourists alike. "For everyone, this is a real plus," says Krewson, who stood at this morning's press conference with a dozen or so bikes behind her, each awaiting a customer needing a ride through the Arch grounds or to get home from work. Scooters and e-bikes will also be provided in the near future.